Coming up on May 16, our fearless team of GeekGirlCon staffers will be taking part in the annual Seattle-area challenge: The Gauntlet! What is the Gauntlet? It’s a 10-hour competition among teams of 4 people each, and they play tabletop games from start to finish for the honor of hoisting the Gauntlet in victory! Part of each team’s strategy involves their fundraising amounts, and bonuses for gameplay called “powerups”. Think of these as cheats or special abilities that they get to use throughout the various games to help boost their chance at winning. Powerups are based on each team’s fundraising and are earned: one at $500, one at $1000, one at $1500, one at $2500, and then one every $2500 after that. 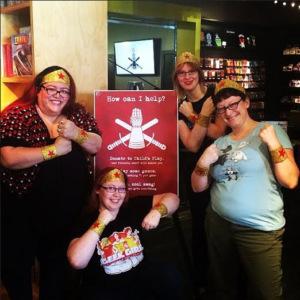 As of April 21, Team GeekGirlCon has just one powerup, but we know more are coming! The 20 participating teams are raising money for Hopelink, a community action agency that has served homeless and low income families, children, seniors, and people with disabilities since 1971. Hopelink has food banks, support services, family development, adult education, and employment training among their many amazing programs. They serve more than 60,000 people in King County every year. 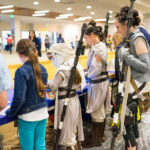 ENGAGE, the charitable giving program within Card Kingdom and Mox Boarding House, is running this contest for the second time, and this year they have doubled their space–allowing for 10 more teams to compete. 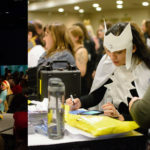 GeekGirlCon is competing for the second time, with staffers Kristine Hassell, Jex Ballard, Sylvia Monreal, and Rose Minier stepping up to take the challenge. Jex Ballard – with the adorable green hair! 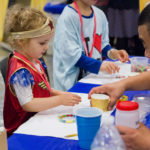 How can you contribute to GeekGirlCon’s Gauntlet team to help them earn more valuable powerups to aid them on game day? You can go to their team page on the Gauntlet website and donate any amount you want to–anonymously or not is completely up to you. To date, Kristine, Jex, Sylvia, and Rose have raised $730, which is 43% of the $1700 they’ve set as their goal! There are 24 days remaining for them to reach that goal and gain more powerups, and with the help of our strong, generous GeekGirlCon community, we KNOW they can do it. 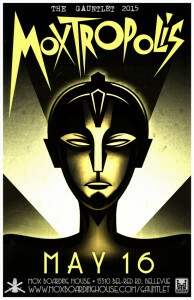 There will also be spectator space available for the competition at Mox Boarding House in Bellevue; stop by for an hour, or stay from start to finish to support GeekGirlCon and the other teams competing for the Gauntlet! Go to the Gauntlet’s homepage for more information. We can’t wait to see you there!